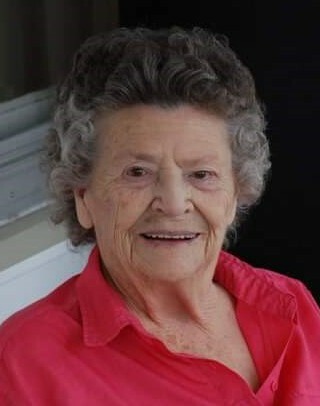 Linnie Mae (Wallen) Anderson, 98, of Hortonville (Sheridan), passed away on Thursday, February 7, 2019 at Harbor Manor at Noblesville. She was born on January 27, 1921 in Somerset, KY to the late John W. and Lula E. (Decker) Wallen. Linnie grew up and lived in Kentucky where she married Alford Allen Anderson in 1938. Linnie had a son, James William, and a daughter, Fostine. She also was like a mother to her nephew, Larry Wallen and his wife, Mona. Linnie was a homemaker and life-long resident of Hortonville. She enjoyed being outside, working in her large garden where many fruits and vegetables were put up for times to come. Linnie always had a smile on her face and enjoyed spending time with family and friends. She also loved good food and socializing. Linnie enjoyed going to Bingo and was a very avid dog lover. She greatly loved her children, grandchildren, great-grandchildren, and great-great grandchildren. Linnie was a wonderful example to all. She was preceded in death by her mother, Lula; father, John; husband, Alford; brothers, Jim and Bill; sisters, Velma and Hazel; son, Bill; and her daughter-in-law, Carol. Linnie is survived by her daughter, Fostine Beals (Larry); a sister, Alice Turney (Jim); and grandchildren, Michele Rohrer (Paul), Lisa Beals, Bill Anderson (Diana), Elaine Grimme (Ben), and Lisa Wallen. She has many nieces, nephews, and great- and great-great-grandchildren who brought joy to her life. Rev. Pete O’Hara will officiate a private family memorial at the Hortonville United Methodist Church. Randall & Roberts Funeral Homes has been entrusted with Linnie’s care.